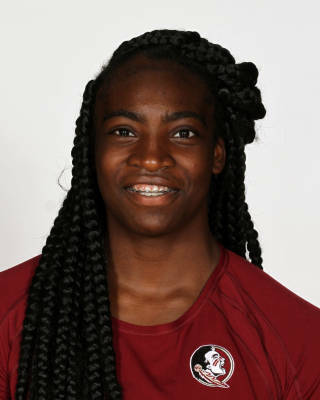 Earned an invitation to the U.S. Collegiate National Team Program in the summer of 2014 … continued to impact the Seminoles lineup as she ranked top five on the team in multiple categories including kills solo blocks (6-t-4th), assisted blocks (101-3rd), total blocks (107-3rd), kills/set (1.94-3rd), blocks/set (1.00-4th) and kills (208-5th) … replicated that effort in ACC play as she ranked among team leaders in assisted blocks (59-3rd), total blocks (62-3rd), blocks/set (4th-1.05), kills (112-5th) and kills/set (1.90-5th) … got the season off to a solid start with six kills and two assisted blocks against Oklahoma (Aug. 28) … followed that performance with eight kills (.353 attack percentage) and four assisted blocks against Colorado (Aug.29) … cinched all-tournament honors at the Omni Hotels Colorado Classic after driving home 12 kills (.391 attack percentage), seven assisted blocks and four digs in a sweep of San Diego (Aug. 29) … drove home 10 kills and added two assisted blocks and two solo blocks at No. 22 Ohio State (Sept. 5) … enjoyed a pair of seven-kill performances against Florida A&M (Sept. 12) and Xavier (Sept. 12) as she combined for nine assisted blocks at the Aloft Seminole Invite … finished with 14 kills (.609 attack percentage) and three assisted blocks against Texas A&M (Sept. 18) … key part of the Florida State offense with a season-high 15 kills (.344 attack percentage) in a clash with No. 5 Florida (Sept. 20) … returned from an eye injury, suffered in late September, to finish with 17 kills, eight digs and seven assisted blocks as the Seminoles won road contests at North Carolina (Oct. 16) and NC State (Oct. 18). That began a stretch of at least seven kills for the next seven matches, including a nine-kill outing against Syracuse (Oct. 23) … was active on defense with five assisted blocks and three digs against No. 22 Louisville (Nov. 15) … capped off her final weekend at Tully Gymnasium by posting 10 kills (vs. Wake Forest) and 11 kills (vs. Duke), completing a pair of four-set wins … anchored the front row with 10 assisted blocks against Georgia Tech (Nov. 25) to go along with four kills … drove home four kills (.417 attack percentage) and contributed six assisted blocks in the sweep of Arizona State (Dec. 3) … contributed five assisted blocks and two kills in the second round NCAA Tournament matchup with Florida (Dec. 4). Added depth to the Florida State front row by ranking top five on the team in multiple categories including assisted blocks (80-3rd), total blocks (85-3rd), blocks per set (0.77-3rd) and solo blocks (5-5th) … mirrored that effort in ACC action as she was top five in four categories including assisted blocks (46-3rd), total blocks (48-3rd), blocks per set (0.80-4th) and solo blocks (2-t-5th) … immediately impacted the Seminole lineup as she contributed eight kills and three assisted blocks in an upset of No. 7 Nebraska (Aug. 29) … slammed home eight kills and added two solo blocks and two assisted blocks in a victory at No. 11 Florida (Sept. 3) … put together a solid effort against American (Sept. 8), as she tallied seven kills, three assisted blocks and one solo block … integral part of the Florida State defense with four assisted blocks in the victory over No. 21 Texas A&M (Sept. 19) … contributed nine kills and six digs as the Seminoles downed Miami (Oct. 5) … topped double figures for the first time in her Florida State career when she finished with 13 kills (.385 attack percentage) and six assisted blocks against Wake Forest (Oct. 26) … drove home a season-high 15 kills (.345 attack percentage) and added three assisted blocks in a five-set win over Clemson (Nov. 2) … was responsible for nine kills (.438 attack percentage) and three digs in a sweep of Syracuse (Nov. 23) … combined for nine kills, six assisted blocks and four digs in three matches in the 2014 NCAA Tournament. Helped the Eagles to 21-10 record during the 2013 season … a standout middle blocker, Vaughn accounted for 18 solo and 96 total blocks in 102 sets played … recorded 276 kills posting a .286 hitting percentage … posted career high of 20 kills against Western Wyoming Community College … recorded highs of 10 blocks twice during the season. Appeared in 61 sets over the course of 19 matches, making 13 starts for the Vols … had a career day against Alabama with nine kills … helped the Vols to earn a NCAA Tournament berth after finishing 22-8 overall. Graduated from Academy Park High School in 2011 … three-sport athlete who was a part of the women’s basketball, volleyball and track & field teams … earned all-state honors in track. Member of the Delaware Volleyball Academy where she was coached by Rich Conly. Born Sept. 17, 1993 … daughter of Mary Underwood … majoring in environmental studies.